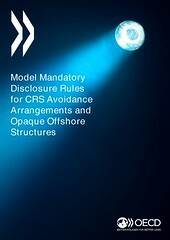 This publication contains the Model Mandatory Disclosure Rules for CRS Avoidance Arrangements and Opaque Offshore Structures. The design of these model rules draws extensively on the best practice recommendations in the BEPS Action 12 Report while being specifically targeted at these types of arrangements and structures. Part I gives an overview of the model rules. Part II sets out the text of the rules. Part III provides a commentary on those rules.